This petition has been created by Made Edy S. and may not represent the views of the Avaaz community. A great miscarriage of justice has been perpetrated against Mr. Krishna Kumar Tolaram Gangtani (Anand Krishna) in that he has been denied the right to the protection of the law and has been unlawfully imprisoned since February 16th, 2013 even though he is in poor health and is in danger while in prison, of attack from people who oppose his religious views.Indonesia is coming under increased scrutiny from the international community regarding issues of religious tolerance, human rights and the independence of the judiciary from a number of organizations including the UN, Human Rights Watch, Amnesty International and the Asian Human Rights Commission which is not conducive to presenting Indonesia as a country which is ideal for foreign investment. Of the three Supreme Court judges who have illegally overturned his acquittal, one has since been sacked for corruption, while a second one is in the process of being investigated for corruption and this is something that needs to be given serious consideration in ascertaining whether the overturning of Anand Krishna was either proper or lawful. Also, as the sacking of the judge involved in the overturning of Anand Krishna's acquittal came out of the huge controversy surrounding his overturning of a drugs related death sentence and his fraudulent changing of the prison sentence from fifteen to twelve years in prison and as the independence of Indonesia's judicial system will very likely come under increased international scrutiny following Indonesia's apparent change in attitude regarding the imposition of the death penalty for drug smuggling, the fact that it was this judge who unlawfully overturned Anand Krishna's acquittal, needs to be given great consideration. Indonesia has signed up to agreements to improve human rights with the UN and has signed the EU-Indonesia Partnership and Cooperation Agreement (PCA) in November 2009, which includes human rights as one of it's four priorities.It is therefore of prime importance that Anand Krishna is given the full protection of the law and released from prison. 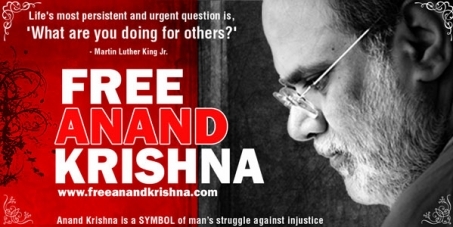 Please sign now and help build a million-strong petition to The Head of The Indonesian Supreme Court and the Minister of Justice & Human Rights to free Anand Krishna immediately and save Indonesia from falling into a state of total disregard for human rights, religious freedom and a fair and independent judicial system delivers justice for all it's citizens.